We’d love your help. Let us know what’s wrong with this preview of How Do I Begin? by Hmong American Writers' Circle. To ask other readers questions about How Do I Begin?, please sign up. 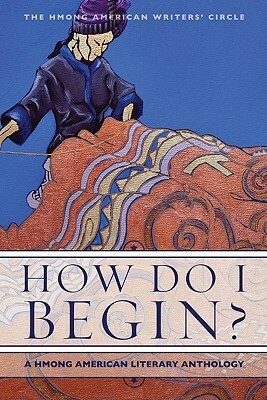 Be the first to ask a question about How Do I Begin? The Hmong American Writer's Circle is a group of writers who are either Hmong refugees or the first generation offspring of the Lao-Hmong people. As such, they are bi-lingual (or more), but without a named home country. The Hmong originated in China, but over several hundred years were forced south until they settled in the mountains of northern Laos. Following the American-Vietnam War, they were again forced to flee due to the assistance they provided to the CIA. These writers come from a cultu The Hmong American Writer's Circle is a group of writers who are either Hmong refugees or the first generation offspring of the Lao-Hmong people. As such, they are bi-lingual (or more), but without a named home country. The Hmong originated in China, but over several hundred years were forced south until they settled in the mountains of northern Laos. Following the American-Vietnam War, they were again forced to flee due to the assistance they provided to the CIA. These writers come from a culture with an immense oral history and tradition, but no written records. With the kinds of work seen in this volume, that is changing and at last some knowledge of tradition will inform future generations. How Do I Begin? is a 200-page anthology compiled by The Hmong American Writers’ Circle based in Fresno, California and published in 2011. It includes pieces from 17 writers as well as three visual artists. Until the 20th century Hmong stories were passed down by oral tradition. As Burlee Vang, founder of the Hmong American Writers’ Circle, notes in the book’s introduction: “there are no novels, plays, or collections of poems, essays, or short stories. There is no account of Hmong life preserved in writing by a Hmong hand and passed down through the centuries.” Thus, these writers are forging into uncharted territory and paving the way for new cultural expression. Each writer in this book attemps to answer the question: Am I Hmong before an artist, the other way around, or are the two inseparable? It is no surprise that each writer has a very different answer. The book is comprised of poetry, short stories, and essays. Some express what it was like to flee war and live in a refugee camp, while others can only wonder at that experience while they write about what it’s like to grow up both Hmong and American. I am not much of a poetry reader, so the short stories stood out more for me. In particular I enjoyed “Pao Dreams of Bodyslams, André the Giant, and Hulk Hogan” by Ka Vang which is full of both humor and sadness as a son deals with disappointing his father to follow his own dreams (and has wild dreams of pounding the living daylights out of André the Giant). This book serves not only as an important record of history, but also as a beginning for Hmong writers all over the country, the continent, and the world. It also serves as a window for non-Hmong Americans and the first step in a path toward greater understanding. I highly recommend this book. You may not enjoy every poem and story in the anthology (with such a diverse collection that would be an outrageous expectation). However, if you’ve been alive in the last 45 years, there is important culture and history in the pages of this book that has been greatly overlooked by our textbooks, arts scenes, and media. We could all stand to put a little bit more effort into learning a few things about our neighbors. uneven, but ultimately very good collection of short stories and poetry. a few pages of art and photographs in the center was a nice bonus. I hope the writers build on their work here and keep publishing. Such an important collection of voices. I'm so glad it exists.